_ Mission work started in the then Southern Rhodesia in 1903 when the Church of Sweden Mission set up a mission base at Mnene Mission, Mberengwa. The first church constitution was established in 1941, the synodical council and the mission council sharing responsibilities. In 1962 a new constitution was adopted, the church council being responsible for church work, educational and medical work assisted by an educational board and a medical board. At the beginning, mission work was concentrated in the districts of Mberengwa, Gwanda, Beitbridge, Mwenezi and Zvishavane hence the establishment of mission stations at Mnene, Masase, Musume, Masvingo, Chegato, Beitbridge, Majini, Zezani and Mazetese. 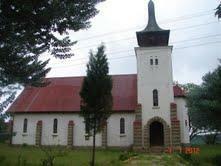 However, with more urbanisation and relocations, the work of the Church moved to towns and cities including rural areas hence the existence of the Church in urban areas such as Bulawayo, Gwanda. Gweru, Harare, Mutare, Zvishavane and Gokwe. 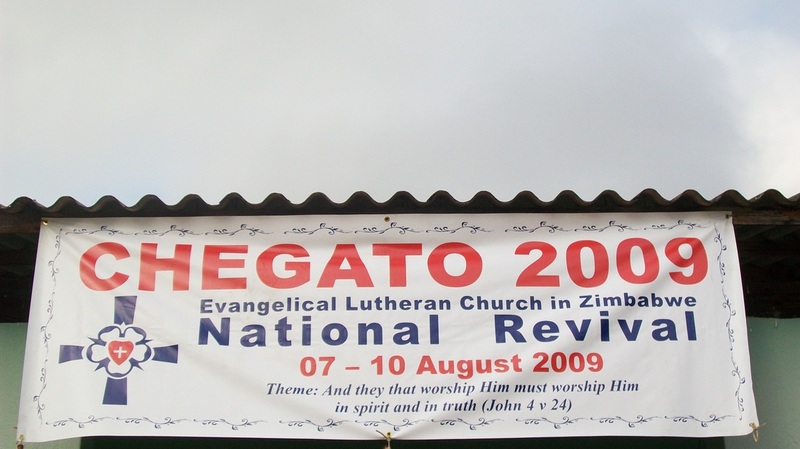 _ The Evangelical Lutheran Church in Zimbabwe (ELCZ) in its quest to continue winning people for Christ and bringing Christ to the people, started a special programme code named training for evangelism and self-reliance in 2000. The programme is in partnership with Lutheran World Federation. The project is conducted in all areas where the church is operating as well as in other mission areas. Interested able pastors and lay persons were crystallized and a team was formed to spearhead evangelism. In each congregation, parish and deanery, the Diaconia Evangelism and Stewardship Committees (DESC) are tasked with seeing that diaconia, evangelism and stewardship are carried out; while at Diocesan level this committee is called Diocesan Diaconia Evangelism Stewardship Board (DESB) and is responsible for organizing Diocesan diaconia, evangelism and stewardship activities. The main goal of the project is to constantly remind members of the Great Commission (Matthew 28:18-20). In this, all believers are reminded that through baptism, they were called to participate in God’s mission. The project also seeks to strengthen and make parishes involved in evangelism and mission work as well as assist parishes know the importance of Christian Education in the life of their parishes. The project also has a remit of strengthening self reliance initiatives of the Church and equip Church leadership with skills to effectively mainstream HIV/AIDS into its evangelistic and ministry work. In all this, the vision of the Evangelical Lutheran Church in Zimbabwe is that of a soul winning church where every believer should share the love of God in Jesus Christ. Ø All non believers in Christ in parishes and mission areas. These are the people who have not given their lives to Jesus Christ. Ø Revive believers in the 3 dioceses and strengthen the faith of Lutherans and non Lutherans within the parishes apart from targeting backsliders. Ø Congregational and Parish Diaconia Evangelism Stewardship Committees (DESC) which are responsible for diaconia, evangelism and stewardship at congregational and parish levels are trained and strengthened. This target group includes Diocesan Diaconia Evangelism Stewardship Boards who are responsible for Diaconia, Evangelism and Stewardship activities at Diocesan level. Ø Sunday School Superintendents and teachers are people who are responsible or Sunday School in congregations and parishes. Ø Development Committees in mission areas which committees are responsible for building chapels and parsonages among other developmental activities are targeted as well. 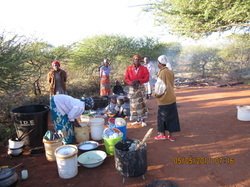 Ø Congregational and parish HIV and AIDS Committees which are responsible for HIV/ AIDS activities are not left out of the project. 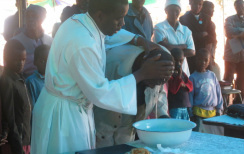 The project is run in the three ELCZ dioceses of the Central Diocese located in the Midlands Province of Zimbabwe, the Eastern Diocese located in the eastern of Zimbabwe covering provinces like Masvingo, part of Midlands, Mashonaland Central, East, West and Manicaland and lastly Western Diocese in the west part of Zimbabwe covering Matebeleland South and North provinces from the Limpopo river in the south to the Zambezi river in the north. Pastors and individual members with leadership and evangelism gifts are empowered with skills for evangelism and teaching self reliance. These members could be women and men, both young and old. This strategy instills a sense of ownership, quickens and strengthens self-reliance, hence achieving interest in winning souls for Christ using local resources.